J. Dunbar Wright : Waikiki Beach Boys, 1916. 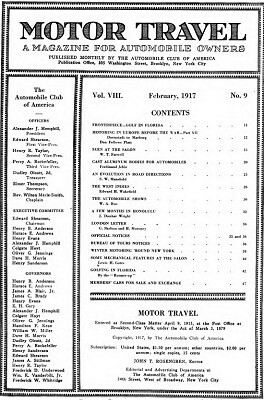 Volume 8 Number 9, February 1917. A report on the attractions of Waikiki, with high praise for the local surf-riders who are a fine set of men in physique and looks, literally live on the beach, give lessons in everything from swimming to eating poi, and play at night in a musical band. I SHALL never forget my first visit to Honolulu; it was in 1898, in the month of April. I remained there only over the night, as I was on my way to Japan to see one of their greatest celebrations—the thirtieth anniversary of the changing of the capital from Kioto to Tokyo. Last year, when I arrived in February just before the carnival, it was quite impossible to get accommodations, and I wandered around a while until a kind bachelor took me in, and I remained with him until I was fortunate enough to secure a little cottage at Waikiki. Of course, the great sport is on the beach and in the water, and from one o'clock in the afternoon until almost dark, the beach at Waikiki is crowded with bathers and sun worshippers. The water is warm all the year round - Christmas and New Year's is celebrated in the ocean - and even if the beach is small and coral is everywhere, you cannot get away from the loveliness of it all. Surfboard riding is wonderfully interesting, also the surf boats or outriggers which can be hired, and there are always boys on the beach to give you lessons in everything from swimming to eating poi. They are a fine set of men in physique and looks, and they literally live on the beach, excepting at night when most of them play in the many musical bands on this island. All said and done, the Hawaiian Islands are there to stay, and I never pick up my little ukulele that happy memories are not brought back of moonlight and sunlight, blue water and the countless other attractions that make one long to return. Geoff Cater (2017) : J. Dunbar Wright : Waikiki Beach Boys, 1916.